An Indiana Jones-inspired adventure that fails to tread new ground. Crisp combat let down by boring enemies, repetitive missions and a disconnected story. I’ve just watched four priestesses open the skies with magic crystals, send the Divine Chariot of King Solomon to the heavens, and call down lightning to destroy a gaggle of cultists. And I’m bored. 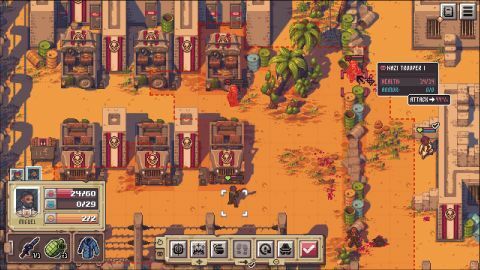 It’s typical of my time with Pathway, a turn-based tactics game in an Indiana Jones-inspired world—it has some fun ideas and I’ve enjoyed it in short bursts, but its insistence on making me grind repetitive missions quickly killed my interest. You journey through North Africa over five missions, each of which has its own pulpy story about stopping Nazis and cultists from raiding old tombs. Missions are a web of waypoints: some are shops to buy more fuel for your rusty jeep, others offer mini stories with choices, such as asking if you want to risk raiding a cursed dungeon to find some extra cash. In combat, which happens every few stops, Pathway plays like a simplified XCOM. I move my squad into cover, knifing and blasting at enemies, healing up, and spending bravery points on special abilities such as a shotgun blast that can damage multiple foes. Each character can perform two actions per turn, usually one movement and one attack, but you can swap either for a heal or reload. Pathway partly relies on randomness, giving you a percentage chance of landing each shot, but I never felt cheated. I always hit my target when I had a clear line of sight. Cover is clearly marked, and you can hover over an enemy to see their movement range, so I always knew where I could safely hunker down. It’s all about positioning your squad to stay out of range of certain enemies and isolate others, and its clear set of rules creates a different tactical puzzle every turn. But those puzzles just don't prove interesting enough to carry such a repetitive game, especially when you start replaying the same missions. Like most modern roguelites, each run in Pathway provides incremental, permanent progression. If all your characters die you fail a mission, but you keep any items you’ve nabbed on that attempt, and your squad retains their level-ups between runs, giving you a better shot next time. For the first four to five hours I enjoyed this cycle, and Pathway’s combat still felt fresh because of how it constantly jumbled my squad composition. You pick a squad of two for a mission from a roster of 16, but you can recruit other characters randomly picked from the line-up after you set off. On one run I met a sniper and grenade specialist, the next a melee expert and a machine gunner. This forced me to try out new tactics and characters, and as my squad grew from two to a maximum of four my approach to combat shifted, which made me feel like I was always making progress. I like that Pathway constantly asks you to make tough choices. Some of the waypoints ahead are marked, so I know what to expect when I arrive. Others are blank, or labelled with a question mark, which means there’s something worth seeing. But fuel is always tight, which creates a dilemma: Do I take the shortest route, or sidetrack in the hope of finding another character to recruit? Do I avoid enemies, or fight through them to reach a shop that might sell high-level gear? But after the first two missions, the lack of depth in the combat starts to show. Arenas are samey—every desert ruin looks and plays alike—and enemies are unimaginative, save for a handful with unique abilities, such as a priestess that revives downed enemies. Some missions rely heavily on zombies, which are boring to fight. They just walk at me mindlessly, making me retreat, take pot shots, and gradually wear down their health. In later missions, Pathway threw 10 or more enemies at me in a single battle and started to feel less tactical. I began some fights surrounded by enemies, making it impossible to avoid damage. The only way to beat these later stages was to level up my characters, improving their stats and grabbing better gear, and unfortunately the only way to do that was to grind missions I’d already completed. This is by far my biggest gripe with Pathway: It makes you grind for the sake of it, rather than because repeating missions is fun. The lack of variety in combat started to grate the moment I restarted an old mission, and I felt like I was just running through the same combat scenarios over and over. Even its randomised story events begin to feel predictable. The devs say there are more than 400 unique events to encounter, but the same ones pop up repeatedly. I must’ve seen a mysterious, humming obelisk 15 times, and in every case my characters failed a dice roll to find out more about it. (Pathway's devs have said they're fixing a bug that causes the same event to happen multiple times in the same mission, but I was already growing tired of the same events repeating between missions). These events don’t relate to the five main stories either, which themselves only receive a few minutes of attention over each two-to-three hour mission. I kept forgetting why I was heading to my final destination. It doesn’t help that Pathway treats North Africa as simply a treasure trove to be plundered: Your group just grabs ancient artifacts from tombs and stuffs them in a sack. As an extra incentive to replay missions, Pathway locks some characters behind lofty objectives that you’ll only complete by putting in more hours, but these characters aren’t unique enough to make that appealing, either. Special abilities are tied to weapon and armor type rather than the characters themselves, so anyone with a pistol can spend bravery on a double shot, for example. The gunners I found early felt just as good as the ones I found later, especially with the upgrades I’d been feeding them. I like that Pathway gives you tough choices about how much fuel you can afford to use, which route to take through a level, and where to position your squad in combat. It’s fun in short bursts, and I enjoyed the way it mixes up your squad composition by randomising the characters you recruit. But completing it is a boring grind, and neither its battles nor world events are varied enough to make each run feel unique when it forces you to repeat missions. It feels like a half-decent 10-hour game unnecessarily stretched to more than double that time. I’d steer clear.